Or, get it for 18400 Kobo Super Points! In scripture, Jesus promises a future that potentially infuses all texts: “my words will not pass away” (Matt 24:28). This book argues that texts—even literary texts—, have an eschatology, too, a part in God’s purpose for the cosmos. They, with all creation, move toward participation in the new creation, in the Trinity’s expanding, creative love. This eschatological future for texts impacts how we understand meaning making, from the level of semiology to that of hermeneutics. 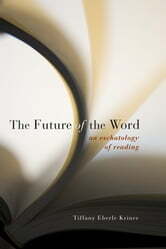 This book tells the story of how readers participate in the future of the word, the eschatology of texts. If texts have a future in the kingdom of God, then readers’ engagements with them—everything from preservation and utterance to translation, criticism, and call and response—can cultivate those futures in the love of the Trinity. Kriner explores how the fallenness and failures of texts, alongside readers’ own failures, while seeming to challenge the future of the word, ultimately point to reading as a posture of reconciliation, in which reader and text meet in the Maranatha of all text. How Do You Know You're Not Wrong? Is Jesus the Only Savior?